Preface. 1. The Principal Lignite Deposits of North America. The Gulf region. The Fort Union region. Other lignites of the United States. 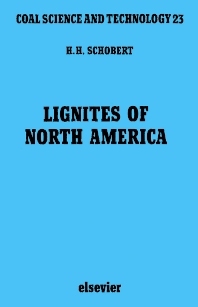 Other lignites of Canada. 2. The Deposition and Formation of Lignite. Paleoflora. Environments of deposition. Transformation of plant material to lignite. 3. The Organic Structure of Lignites. Petrography of lignites. The carbon skeleton. Heteroatoms. The three-dimensional structure of lignite. 4. Fundamental Organic Reaction Chemistry of Lignites. Reactions with carbon monoxide. Reactions with hydrogen. Reactions in other gaseous atmospheres. Pyrolysis of lignites. 5. The Inorganic Constitutents of Lignites. Incorporation of major elements. Minerals in lignites. Trace elements. Variability of inorganic composition. 6. Behavior of Inorganic Components of Lignites. Low-temperature ashing. Reactions of exchangeable cations. Mineral reactions at elevated temperatures. Thermal properties of ashes and slags. Sintering. Ash fusion. Slag viscosity and surface tension. 7. Physical Properties of Lignites. Bulk mechanical properties. Density. Thermal properties. Surface area and porosity. 8. Moisture in Lignite. Equilibrium moisture. Measurement of moisture by elevated-temperature methods. Evidence for bimodal incorporation of water. Adsorption and desorption of moisture. Heat of wetting in water. 9. Mining, Transportation, and Storage. Lignite mining. Transportation. Handling and storage. 10. Beneficiation of Lignite. Drying. Removal of mineral matter. Removal of inorganic constituents by ion exchange. Desulfurization. Size preparation. Briquetting. Lignite/water slurries. 11. Combustion of Lignites. Fundamentals of lignite combustion. Small-scale combustion systems. Current combustion practice. Ash deposition, slagging and corrosion. Fluidized-bed combustion. 12. Alternative Uses of Lignites. Gasification of lignite. Direct liquefaction of lignites. Chemical products from lignites. Combustion of lignite-water slurries. Index. Providing a comprehensive survey of the origin, the fundamental properties, and the technology of utilization of the lignites of North America, this book will be of particular interest to professional scientists and engineers working in coal research or coal technology. Coals display a continuum of properties, often with no sharp, steep change between ranks and thus the book restricts the discussion strictly to lignites (with the occasional comparisons with other coals). There is a very extensive index, making the contents of the book easily accessible to the reader.